You still enjoy home... your comfortable chair, your life-long treasures surrounding you, the privacy and freedom to make your own decisions. Frankly, why would you want to leave your home? Life has a way of altering our plans. When your health is compromised and you are faced with a health challenge, what measures will you seek to remain in your home? Palms Home Care wants to help you achieve your goal of "staying home". It's a proven fact, recovery is quicker when you are in familiar surroundings. Don't delay, call Palms Home Care today! Palms Home Care is accredited by Accreditation Commission for Health Care (ACHC) for compliance with a comprehensive set of national standards. 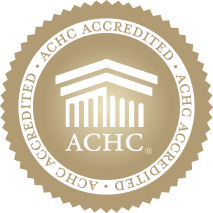 By choosing a healthcare provider that has achieved ACHC accreditation, you can take comfort in knowing that you will receive the highest quality of care. If you have any concerns about the product or service that you receive from Palms Home Care, you may contact ACHC directly at (855) 937-2242. Copyright © 2006. All rights reserved. Website design and hosting by Mediajaw.